It's looking like the storm is going to stay to the east of us and that is an answer to prayer. As we watch the weather those of us who have been through this before understand how difficult life can be in the aftermath of a strong storm. The other problem is the lack of funds. This is low season and everyone is in need already. As I look at the storm out in the Caribbean , and our financial storm as well I was remained of the faith of Shadrach Meshach and Abednego as they were facing burnout. They told king Nebuchadnezzar If we are thrown into the blazing fire the God we serve is able to save us but even if He does not save us we will be faithful. We need your help and your prayers... We are at a break through point in the life of the church here in Playa and the enemy is not happy. Last night on the way to the prayer meeting one our key preachers for the event was involved in a car accident with a taxis.. Everyone was OK but they did not make it to the meeting..... God is getting ready to do great things in Playa through our church and we need you to join this movement. First we NEED YOUR PRAYERS then we NEED YOU TO GIVE. We now ask you to pray that one uninvited guest would not make it to our Playa del Carmen outreach event on Sat. night. We have stepped out on faith and we have put all of the money we have, $3000. in making this kick off banquet a really special event. 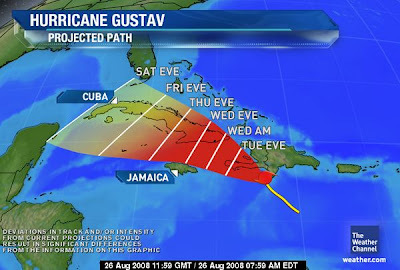 Now the weather Channel is saying hurricane Gustav could be a strong Cat 3 storm on Sat. night. As many of you know we live in a grass roof house but our house is not my greatest concern. We have over 100 lost people who are now planning to attend our outreach event on Sat. Pray that Gustav will not change their plans. Please pray for our safety, our finances and our success as we reach out to the people of Playa. The tickets for our kick off banquet went on sale today and they were sold out in five minutes. We sold 150 tickets we should have 100 non-believers at our out reach banquet on the Sat. August the 30th. Please pray for this night and the activities of the week. Wed. we will be having an all night prayer meeting praying for these 100 non-believers. Sat is the big event in Playa Del Carmen. We need your prayers. Pray for us this week as we are going to be launching a 4 month long spiritual growth campaign. Pray for us tomorrow as we meet in Paamul. I will be praying both services English 9:45 and and Spanish 11:30. We are going to launch a 4 month spiritual grow campaign in Playa Del Carmen. This campaign will begin with an outreach banquet and Ministry fair on Aug. 30th. PLEASE PRAY FOR THIS OUTREACH BANQUET! We first met Blanca as the Volunteer Mission team from Myrtle Beach was prayer walking in Playa Del Carmen. There is power in prayer now Blanca is serving as part of our praise team. Pablo just moved to Playa about 3 weeks ago looking for a new life and he has found that is Christ. He is our new drummer on our praise team. This is young man has been coming to our church for a month or so. God save him out of a life of Drug abuse. Pray for Jesus as he seeks to fellow Christ. I just met this young man last week as well. Aram is already serving God in our church playing the guitar in our praise band. Pray that these new believers will grow in Christ and share the Good News with there friends. We are asking for your prayers for our weekend services in Paamul. I will be preaching in English and Spanish. We also have a baptismal service that will follow the Spanish worship. Our daughter Brittany is here with us this week and she will be celebrating her 21st birthday tomorrow. Last night we had an exciting prayer meeting with our church leadership. God is moving us to action. On August 30th we are going to have a kick off worship service and banquet in Playa Del Carmen. We are going to conduct a five month long church wide spiritual growth campaign. 1.Pray and motivate your church friends to also pray for this movement of God. a. You might want to do a Mexican dinner night to help raise the funds we need. 3. I really want you and your church to be part of this movement of God in Playa. So if possible make plans to come down and worship with us. Please prayer for these church leaders as they lead our church wide Spiritual Growth Campaign. They need your encouragement, most of them only speak Spanish but if you feel led to email these leaders and let them know you and your church are praying for this Campaign that could be a great help. These 15 people along with others are going to play a key role in this movement in Playa del Carmen. The goal is to build a great church among the growing middle class workers in the Playa Del Carmen area. Pray that we will start 12 new small groups and have 200 in the weekend services by Jan. 09. We need your prayers as we meet with our group of leaders tonight to start planing our next step as a church. You are going to be hearing more about this as we try to reach out to the growing Mexican middle class families living in Playa del Carmen. I often wonder how Moses must have felt as he faced the Red Sea….. It seems like I have a Red Sea experience about once a week. Truly I don’t know how many times God has lead us through deep waters… You would think after living down here for 12 years and always living on the edge of disaster we would not be surprised any more but God always parts the waters in a unique and special way like only He can do. We had a great leadership meeting Sunday, 17 people are now on our leadership team. We are now planning a church wide outreach campaign " Living with Purpose" over the next 4 months. We hope to have the kick off to this campaign in Sept. The plan for now is to start with a kick off banquet September 4th our goal is to have 100 people at this first banquet. We will follow this with a ministry and mission fair… and over all goal is to have 200 people in our weekend services by Jan. We are now running about 50 in our spanish service in Paamul. Our next planning meeting is Wed. night please pray as we organize and build teams for this campaign. We are going to need a prayer team, program event team, communication team, small group connection team, ministry fair team, Children and youth outreach team. Pray that we will find the leaders we need for each task…. Today at 3:00pm I am teaching a class in Spanish.... helping church members discover their spiritual gift and their place in ministry. Tomorrow I will be preaching in English at 9:45am and Spanish at 11:30am. At 2:00pm I will be leading an important leadership meeting. We are making plan to start worshiping in Spanish in Playa.